C. Robert Markert is an ordained Roman Catholic deacon who has done commissions in a variety of media for Catholic, Orthodox Christian and Jewish congregations, and for secular clients such as Kosair Children's Hospital. He studied iconography under an Orthodox monk. He sees his artistic role as a part of the servant role of a deacon, helping the work of art come to life. He directed Studio2000, which hires inner-city children for art projects needed by the city. 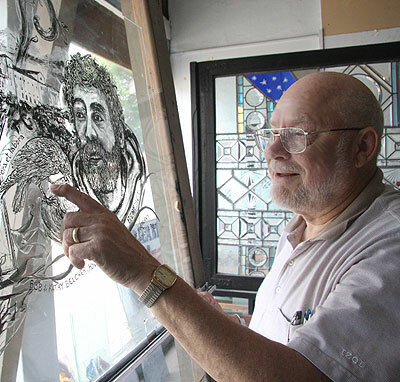 Markert created the stained-glass windows in Highland Baptist Church's sanctuary in 1971 and 1972, and he returned to extend the "Cloud of Witnesses" theme to the Fellowship Hall in 2008 and 2009. Markert created the Fellowship Hall windows at Eichorn Stained Glass studio on East Broadway. He based the images on old photos, books, traditional iconography and imagination. He first sketched out the images on paper and then painted them free-hand on the glass, using a dark paint mixed with a gum Arabic to give it a firmer texture. After painting the original image, he used a pick to created cross-hatches that develop shadows and highlights. After he completed the images, the windows were fired for several hours in a kiln at the studio, with temperatures reaching 1,00 degrees Fahrenheit. The windows were then installed atop the clear windos in the Fellowship Hall in Highland Baptist Church. "The artistry of Robert Markert illumines a unique collection of women and men whos living artistry illumined the mystery and glory of God, the Artist of Life. This was the project's purpose: To recall and celebrate the varied ways that the Sacred is seen in finite human beings who offered their lives to God's work of Love. 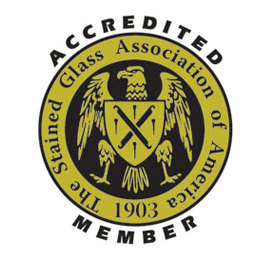 Just as the members of this collection would object to their qualifications as saints, the same must be said for the collection itself. This is one collection, gathered with love, but also with the grateful realization that many other saints would illumine even more dimensions of God's beauty and creativity. We sought within our given limits to cover the span of Christian heritage throughout time and nations, with a particular eye toward those who have shaped Highland Baptist Church. Markert's brush and pen brought forth powerful images for our recall and inspiration. But these works alone are lifeless. Only when the images are accompanied by light from behind and within do they come to life and invite us to see more than even the artist knew was there. This is as it should be. Only when these humans gave themselves to the Light did something shine forth in them to reveal more than they knew was there. In seeing the saints may we see the Light.